Your holiday season should be merry and bright, not wasteful and stressful. As you make your holiday shopping lists, keep the environment in mind. Try some of these gift-giving alternatives this year. Here are your waste-less to-dos for the holidays. Make a List (and Check It Twice! ): Write down all the names of people for whom you normally buy gifts. Is there someone on the list that you’d like to see more often? Instead of giving a gift, make arrangements to get together or promise a monthly visit. Stick to a Budget: Decide in advance how much you plan to spend on holiday giving. Once you have a total, estimate an amount for each person on your list. The little extras, such as stocking stuffers and accessories, can add up. Made by You: Put your skills to work and make homemade gifts, such as scarfs, ornaments, and baked goods. Decorate an old picture frame and add a photo. Put your old jewelry, clothes, and hats into an unneeded suitcase to create the perfect dress-up chest for a child. Give an Experience: Do you have friends or relatives who are sports fans but don’t go to games very often? Give them tickets! Not a sports fan? Give tickets to a concert or play, a movie gift card, a museum membership, or park passes. Remember to Reuse: Reusable shopping bags aren’t just for groceries! Wherever you are shopping for holiday gifts — antique stores, secondhand stores, or the mall — carry your own reusable bags with you to the store. Don’t Forget to Recycle: Provide bins for bottles and cans during holiday parties. Recycle non-metallic wrapping paper and holiday cards, too. When your fresh holiday tree dries out after the holidays, remove all of the decorations and the stand and set it at the curb next to your containers. We will collect it from the curb and deliver it to a facility where it will be ground and turned into mulch. 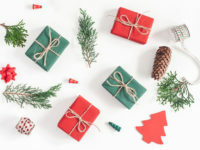 For more ideas, check out Earth-friendly Holiday Gifts and Invite the 3-R’s to Your Holiday Party.